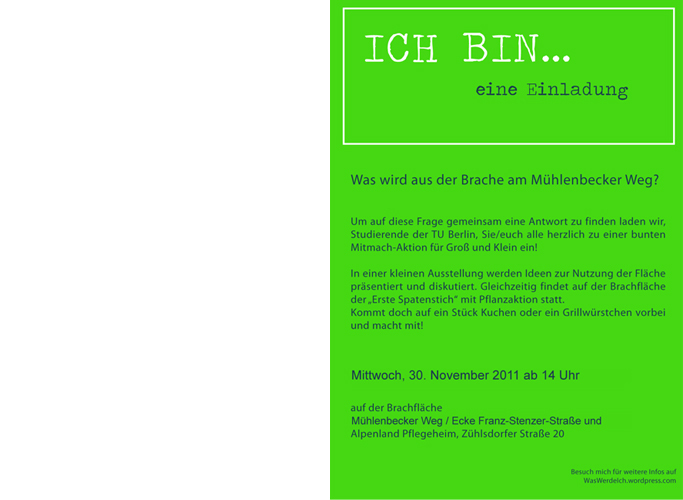 PROJECT PRESENTATION: Spiel/Feld Marzahn, on Saturday 3rd November 2012, 12 noon, at the site on Mühlenbecker Weg, Marzahn. With Kristian Ritzmann as part of the 4th AESOP Sustainable Food Planning Conference. 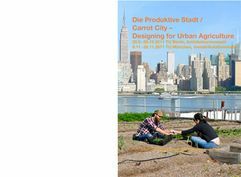 INVITED EXPERT MEETING: Urban Agriculture and Biodiversity. Arbeitsgespräch on Wednesday 6th March 2013 at Rathaus Lichtenberg in Berlin. With Katrin Bohn. AKTEURETREFFEN: AG Freie Gärtner on Wednesday 13th March 2013, 4pm, at Peter-Pan-Grundschule. 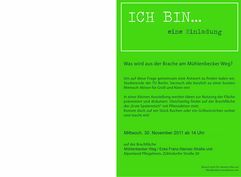 This event is part of Spiel/Feld Marzahn, a project of our department City&Nutrition. AKTEURETREFFEN: AG Freie Gärtner 3rd meeting on Wednesday 6th February 2013, 4pm, at Familienhaus Felix. This event is part of Spiel/Feld Marzahn, a project of our department City&Nutrition. PRESENTATION: Spiel/Feld Marzahn, a project of City&Nutrition is being presented on Friday, 15th February 2013 during Epilog, the end-of-semester show at ILAUP. With Yvonne Griephan and Regina Otters. 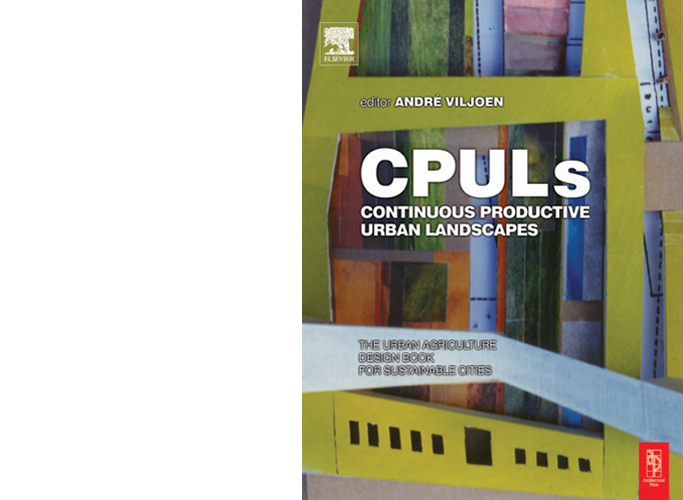 CITATION: in January 2013, The Urban Farming Project Middlesbrough features in Cultivons nos villes!, a publication by equiterre. Bohn&Viljoen acted as consultants on the project. CONFERENCE: 4th AESOP Sustainable Food Planning Conferencefrom 1st November to 3rd November 2012, at Jerusalemkirche Conference Centre Berlin. With Andre Viljoen and Katrin Bohn as track chairs. PUBLICATION: New Approaches to integrating Agriculture and the Urban, invited article by Katrin Bohn and Andre Viljoen in Manzar, the Scientific Journal of Landscape, Iran, November 2012. AKTEURETREFFEN: AG Freie Gärtner 2nd meeting on Wednesday 21st November 2012, 4pm, at Familienhaus Felix. This event is part of Spiel/Feld Marzahn, a project of our department City&Nutrition. 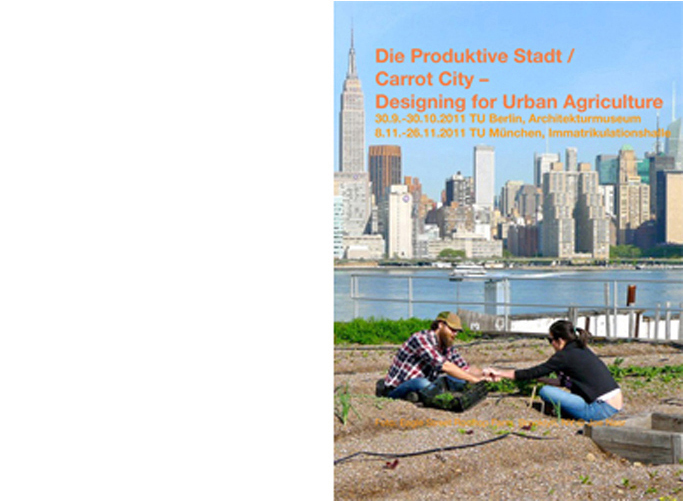 LECTURE: Urban Agriculture and the Urban Food System, on Tuesday, 6th November 2012, 2pm, at the School of Architecture and Design, University of Brighton. 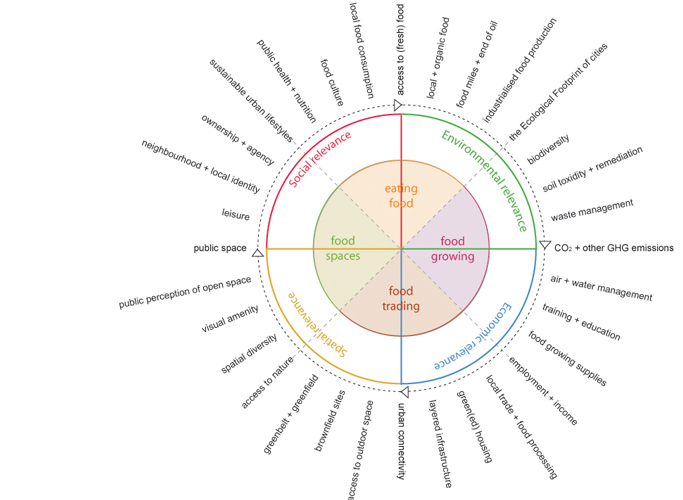 With Katrin Bohn as part of the Edible Campus Option Study. 2nd stakeholder meeting with Katrin Bohn and Kristian Ritzmann amongst others at the project site in Berlin, Germany. Katrin Bohn amongst others at: Die Internationale Grüne Woche 2012, Berlin, Germany. Urban design exhibition at: Transition Town Hannover, 18th January - 28th February 2012. In this format, originally co-curated, designed (DPS posters) and co-researched (Berlin cases) by Stadt & Ernährung (Bohn, Awan, Ritzmann, Hasenstab). Katrin Bohn, Undine Giseke and Carlo W. Becker at: ILAUP, TU Berlin. Event co-run by Stadt & Ernährung (Bohn, Ritzmann). 2nd public event at the project site in Berlin designed and run by Stadt & Ernährung (Bohn, Ritzmann) with TU Berlin MALA students. Bohn&Viljoen Architects for Urban Natur at: 70°N arkitektur-as, Tromso, Norway. Urban design exhibition at: Immatrikulationshalle, TU München, 8th - 26th November 2011. Co-curated, designed (DPS posters) and co-researched (Berlin cases) by Stadt & Ernährung (Bohn, Awan, Ritzmann, Hasenstab). André Viljoen and Bohn&Viljoen Architects at: 3rd AESOP Sustainable Food Planning Conference, Cardiff, UK. Katrin Bohn amongst others at a talkshow with architecture students of the Bergische Universität Wuppertallead by Prof Klaus Overmeyer and Isabel Finkenberger in Berlin, Germany. 1st public event at the project site in Berlin designed and run by Stadt & Ernährung (Bohn, Ritzmann) with TU Berlin MALA students. 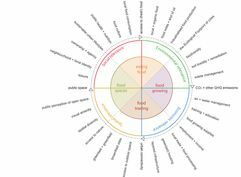 Expert interview with Katrin Bohn by the research project team of the Leibniz-Institut für Agrarlandschaftsforschung (ZALF) e.V. Berlin, Germany. 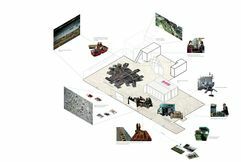 Bohn&Viljoen Architects for Remnants: Reflecting Wales at Design Circle RSAW South and the Welsh School of Architecture, Cardiff, UK. Urban design exhibition at: Architekturmuseum der TU Berlin, 30th September - 30th October 2011. co-curated, designed (DPS posters) and co-researched (Berlin cases) by Stadt & Ernährung (Bohn, Awan, Ritzmann, Hasenstab). Katrin Bohn with Heidi Helmhold and Annabelle Weege at: Institut für Kunst und Kunsttheorie, Universität zu Köln, Germany. A Viljoen, K Bohn, G Denny, M Tomkins at: 48th World Congress of the International Federation of Landscape Architecture (IFLA), Zurich, Switzerland. 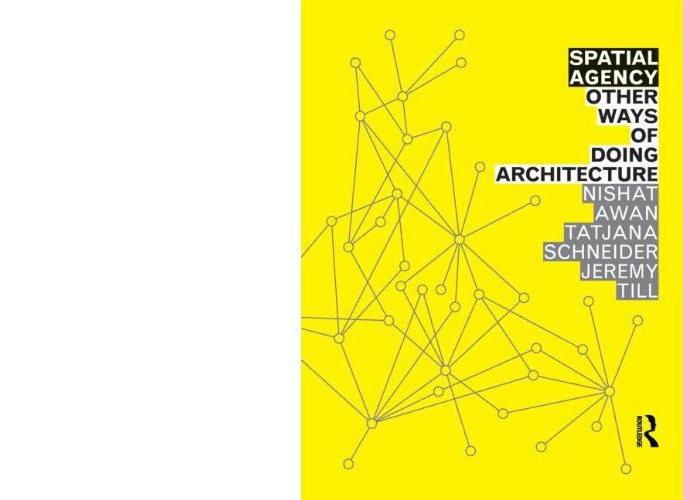 Nishat Awan, Tatjana Schneider, Jeremy Till, Spatial Agency: Other ways of doing architecture, Routledge, London, 2011. André Viljoen & Katrin Bohn, at: International Conference on Urban Harvest and Sustainability, Camara Municipal do Seixal, Portugal. 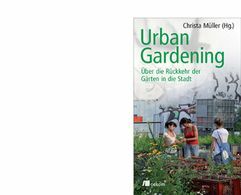 Katrin Bohn & André Viljoen in: Christa Müller (ed. 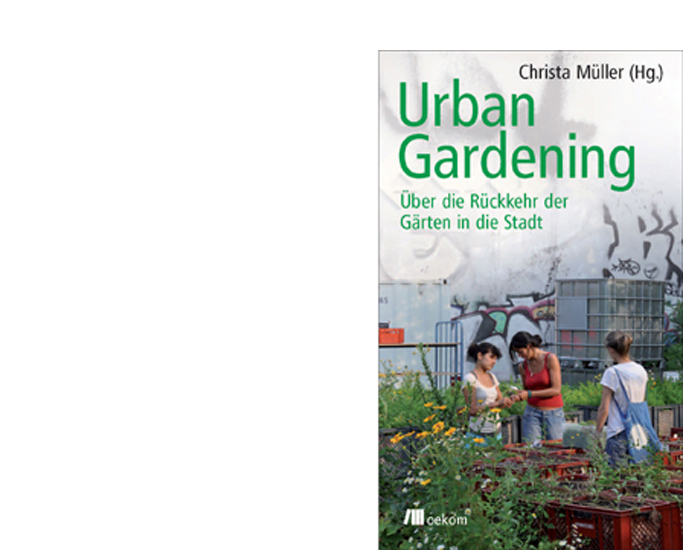 ), Urban Gardening: Über Die Rückkehr Der Gärten in Die Stadt, Oekom Verlag, 2011. 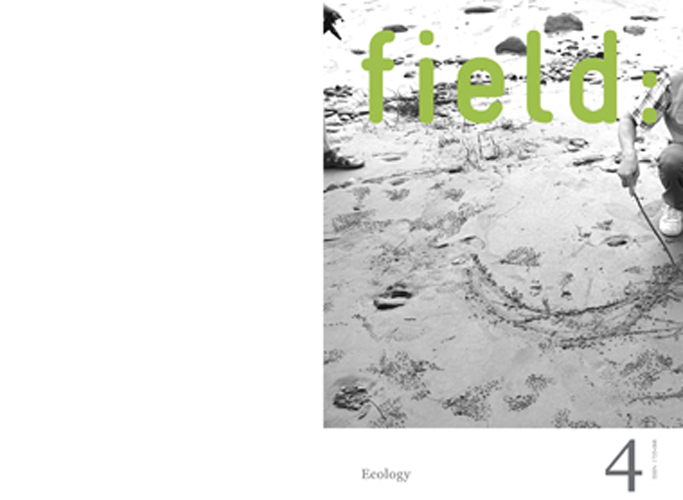 Katrin Bohn & André Viljoen, in: field: Ecology 4(1): 149-162, online publication. Doina Petrescu, Constantin Petcou, Nishat Awan (eds. ), aaa/peprav, Paris, 2011. A Viljoen, K Bohn, M Tomkins, G Denny in: Prosdocimi Gianquinto, F. Orsini (eds), II International Conference on Landscape and Urban Horticulture, ISHS,Bologna, 2010. Katrin Bohn, and André Viljoen at: 2nd AESOP Sustainable Food Planning Conference, Brighton, UK. Interview with Katrin Bohn in: LANDSCAPE the journal of the Landscape Institute UK, London, 2010. Katrin Bohn, for Aufgabenfelder at: Institute für Landschaftsarchitektur und Umweltplanung (ILAUP) TU Berlin, Germany.